Ok, enough facts, time for the awesome DIY fun. Thanks to www.joann.com, there is an awesome craft to make a Narwhal out of a balloon! It is literally as easy as inflating the balloon, printing and cutting out the template, and taping it to the balloon. NEW YORK, NY (April 5, 2019) – Kathie Lee Gifford released her film directorial debut today, which can be found at www.godwhosees.com. The God Who Sees is a breathtaking short film based on the song of the same title, available also on iTunes now, and is written by Gifford and Grammy-nominated, Nicole C. Mullen. Mullen is featured as the narrator and performer as she journeys throughout the Holy Land recounting the stories of Hagar, Ruth and David during their wilderness experiences, and ending with Mary Magdalene in Jerusalem at the tomb of the Risen Savior, Jesus. In addition to the accompanying film, the song, photos, behind the scenes, a “Making Of” featurette, other resources and materials are available at www.godwhosees.com. The God Who Sees is a product of Gifford’s The Rock, The Road, and The Rabbi Foundation, which she established through her heart for rabbinical study and her life-changing experiences in Israel, with a purpose to utilize the arts to produce films and music that will bring the glorious experience of learning Scripture from the Holy Land to a hurting world. To highlight Gifford’s final week on NBC’s TODAY, Mullen surprised her with a stirring rendition of the song, seen in this emotional performance live on the TODAY Show here, earlier this week. The 11 ½ minute song “The God Who Sees,” which quickly rose to the top of iTunes charts immediately upon this week’s release, can be purchased here. Kathie Lee established the foundation after being so strongly impacted by her rabbinical study trips to Israel in recent years. She decided to set up a 501c3 to be used as an evangelistic tool seeking to share the Word of God and hoping to touch souls. Kathie Lee’s belief is that the Word of God, when studied in the land of its origin, with extraordinary rabbinic scholars, is the most transforming power she’s ever experienced. In light of that, she looks forward to using the arts to produce films and music that will bring the glorious experience of learning Scripture from the Holy Land to a needy world. The first project is the short film, THE GOD WHO SEES. She co-wrote the song with Grammy-nominated Christian artist, Nicole C. Mullen. Nicole also performs the song. They traveled to Israel in March of 2019 to film with Kathie directing the powerful piece. Kim possible is out on DVD, which many of you already know because you have followed my blog and entered the contest for the DVD giveaway. What’s the sitch now? Well thanks to Disney Channel, there is even more fun to be had! To celebrate the release of Kim Possible’s live action scenario, Disney Channel has released a fun yet fashionable DIY necklace craft for all the fans to make and enjoy! To fownload the instructions and the templates click the image below and save the PDF to your computer. Then print and create! 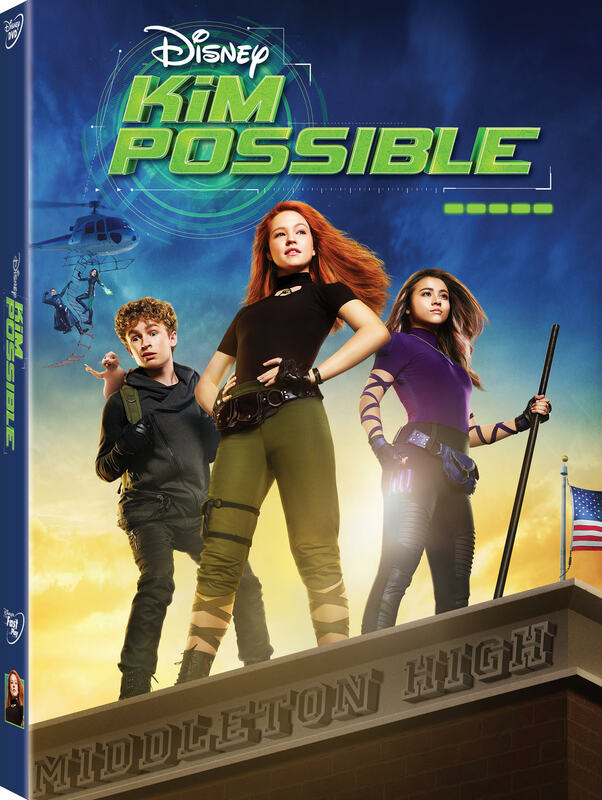 The live action movie of Disney Channel’s Kim Possible is now on DVD! We get to watch a basic average girl save the world with her best friend Ron, his naked mole rat Rufus, computer genius Wade, and a new member to Team Possible. Athena. But saving the world is going to look easy when it comes to starting school as a freshman in high school. Although, Dr. Drakken doesn’t help the situation and actually seems to have big plans this time around. In honor of Disney Channel’s release of Kim Possible on DVD, Disney has given their fans a fun Dr. Drakken Milkshake recipe activity the whole family will enjoy, especially if we are looking for something sinister to quench our thirst. To get the recipe simply click the image below and download the PDF to your computer. Then print and create for the delicious yet evil drink. “Call me, beep me, if you want to reach me.” is a song many of us grew up with when it comes to one of Disney Channel’s best animated series, Kim Possible. The show features a high school girl named Kim Possible who saves the world with her best friend Ron, his naked mole rat Rufus, and a computer geek named Wade. Together they make up Team Possible. Inspired by the animated series, the studio that brought us Teen Beach and Descendants, brings Kim Possible to life in their new live-action movie available on DVD March 26th. I received a copy of Kim Possible on DVD to do a review. Kim Possible the movie takes place in the time before the animated series. In the animated series, Kim Possible is 16 year old teen, confident, and taking on some of the most dastardly super-villains. In the movie, she has been thwarting evil villains but has yet to embark on her most dangerous mission yet…being a freshman in High School. Kim Possible the movie is actually a pretty decent Disney Channel movie. The graphics weren’t half bad, Sadie Stanley is an awesome actor who did Kim Possible justice, we get to see Christy Carlson Romano (YAY), and the story line is meaningful and action packed. I call it a win all around. When the movie first starts, the audience dives into an immediate life threatening scenario where Kim and Ron must save a scientist and the world from dying in a sparkly acidic sludge. But it turns out to be “so not the drama” as Kim saves the day with the help from Wade. Ron, well he was there and…helpful. I will admit the whole scene felt a little cartoonish, but then again, Kim Possible is based off of a cartoon so it works. The drama begins when Kim and Ron start high school and find that their freshman year will be harder than planned. Kim soon discovers that freshman can’t be on the soccer team, classrooms are on separate ends of the school (making her always late), and no matter what she does, perfection seems impossible to reach, especially when a new friend, Athena, joins their team out-shinning Kim from the moment she gets her hair done. All this leads to the fading of Kim’s spark, which gives the evil Dr. Drakken and Shego a chance to once again try and take over the world. With her spark diminished, Kim seeks assistance from her family to find out who she is since she isn’t the best crime fighter. She learns from her grandma that crime fighting is what she does, not who she is. So just like Kim’s life has changed by entering high school, so does her perception of who she is or who she is meant to be. Meaning, Kim is one step closer to becoming that 16 year old, confident, crime fighting hero we all totally love. I found it pretty awesome that instead of Kim seeking help from someone outside of her family unit, she actually looks to her grandma, mom, and dad. Her faith in her family is actually what helps her overcome the new feelings of inadequacy, making her even more confident and heroic. No matter what happens, her family is there to help, proving once again that anything is possible for a Possible. If you are a Kim Possible fan like myself, here is a chance for you to own the all new Kim Possible DVD! Simply follow he instructions and enter for a chance to win. Some of the tasks can be done daily for more entries! SPIDER-MAN: INTO THE SPIDER-VERSE, swings onto 4K Ultra HD Combo Pack, Blu-ray Combo Pack, and DVD on March 19 from Sony Pictures Home Entertainment and Sony Pictures Animation. I was lucky enough to receive a copy of the DVD to do a review and I can’t believe what I just watched. My thought of this being another cliche story was soon tossed into the wind provided by Spider-Man from 1933. You know, the one that likes to fight Nazis…a lot. While this story of Spider-Man does feature the, “boy gets bit by a radioactive spider” scenario, Miles’ beginning is a little different. He starts by learning he is not alone in his endeavor to save the world. Heroes are everywhere, in everyone, and even in other dimensions, such as Peni Parker or Peter Porker. The refreshing and bold design of Spider-Man into the Spider-Verse revitalizes the fandom with quirky characters, awesome art, and the seamless combination of comic books and movies. It is a must watch for any Spider-Man fan! And yes, that is a Black and White Spider-Man trying to figure out the rubik’s cube in the image below. Now if you will excuse me, I am going to go burn a match down to my finger tips and get in touch with my inner Spider-Man Noir. Disney Family Has a Printable 2019 Calendar! From Pi Day (3.14) to Gingerbread House Day, the Disney Calendar tells us some of the awesome holidays we all love to celebrate. It even lets us know when Star Wars Episode IX will be in theaters! Of course, other release dates are included such as Dumbo, Frozen 2, and Artemis Fowl. This Calendar will certainly help Disney Fans to remember all the important Disney dates. To download a copy of this marvelous printable calendar go to Family.Disney.Com and click the download link. Then save the PDF to your computer. To make simply Print, fill with important dates, and display. In recognition of International Women’s Day, DreamWorks Animation has assembled the cast, crew and young fans of She-Ra and the Princesses of Power to remind girls around the world they have the power to achieve anything they set their mind to. In a newly released video, the cast of She-Ra, including Aimee Carrero (Adora/She-Ra), Lauren Ash (Scorpia), Marcus Scribner (Bow), Karen Fukuhara (Glimmer), Merit Leighton (Frosta), Krystal Joy Brown (Netossa) and executive producer Noelle Stevenson open up about what She-Ra and its positive portrayals of women and girls means to them and the impact it has on the young audience who watches the show. Led by Stevenson, She-Ra and the Princesses of Power features a wide variety of female characters brought to life by a diverse voice cast, with an all-female writers room, majority female crew, and a dedication to centering the stories of women in a way that both children and adults can relate to. The series is showing young audiences that no matter how they look or who they choose to be, they are worthy of love, respect, and a starring role in the stories they adore. Join She-Ra in fighting the good fight – and forge a #BalanceforBetter in the world. To download the fun activities click the links above and save each PDF to your computer. Then print and create for tons of fun. Or click the image below to download all of the activities at once..